to a wall. The die-cast keys have bright, easy-to-read yellow graphics. assume the state it was in when power was removed. internal sounder beeps when each key is pressed. “service” switch or automatic timer that will disable the Relay #1 when required. 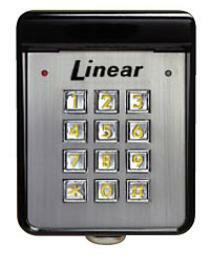 ajar, lockout, alarm circuit shunting, request-to-enter, and keypad active conditions. separate power supply. The EEPROM memory retains all entry codes and programming, even without power.